The first woman to become a fixed-wing pilot in the Afghan Air Force has requested asylum in the U.S. The New York Times reports that Capt. Niloofar Rahmani applied for asylum this summer, but revealed her decision last Thursday, right before she was set to wrap up a 15-month-long stint training at different U.S. Air Force bases. In a picture taken on April 26, 2015, Afghanistan's first female pilot Niloofar Rahmani, 23, sits in a fixed-wing Afghan Air Force aviator aircraft in Kabul. With a hint of swagger in her gait, Afghanistan's first female pilot since the ouster of the Taliban is defying death threats and archaic gender stereotypes to infiltrate an almost entirely male preserve. In a picture taken on April 26, 2015, Afghanistan's first female pilot Niloofar Rahmani, 23, climbs into a fixed-wing Afghan Air Force aviator aircraft in Kabul. With a hint of swagger in her gait, Afghanistan's first female pilot since the ouster of the Taliban is defying death threats and archaic gender stereotypes to infiltrate an almost entirely male preserve. In a picture taken on April 26, 2015, Afghanistan's first female pilot Niloofar Rahmani, 23, poses for a photograph at an Air Force airfield in Kabul. With a hint of swagger in her gait, Afghanistan's first female pilot since the ouster of the Taliban is defying death threats and archaic gender stereotypes to infiltrate an almost entirely male preserve. In a picture taken on April 26, 2015, Afghanistan's first female pilot Niloofar Rahmani, 23, talks with colleagues at an airfield in Kabul. With a hint of swagger in her gait, Afghanistan's first female pilot since the ouster of the Taliban is defying death threats and archaic gender stereotypes to infiltrate an almost entirely male preserve. In a picture taken on April 26, 2015, Afghanistan's first female pilot Niloofar Rahmani, 23, examines a fixed-wing Afghan Air Force aviator aircraft in Kabul. With a hint of swagger in her gait, Afghanistan's first female pilot since the ouster of the Taliban is defying death threats and archaic gender stereotypes to infiltrate an almost entirely male preserve. In a picture taken on April 26, 2015, Afghanistan's first female pilot Niloofar Rahmani, 23, looks on as she talks with colleagues at an airfield in Kabul. With a hint of swagger in her gait, Afghanistan's first female pilot since the ouster of the Taliban is defying death threats and archaic gender stereotypes to infiltrate an almost entirely male preserve. In a picture taken on April 26, 2015, Afghanistan's first female pilot Niloofar Rahmani, 23, leaves her office at an Air Force airfield in Kabul. 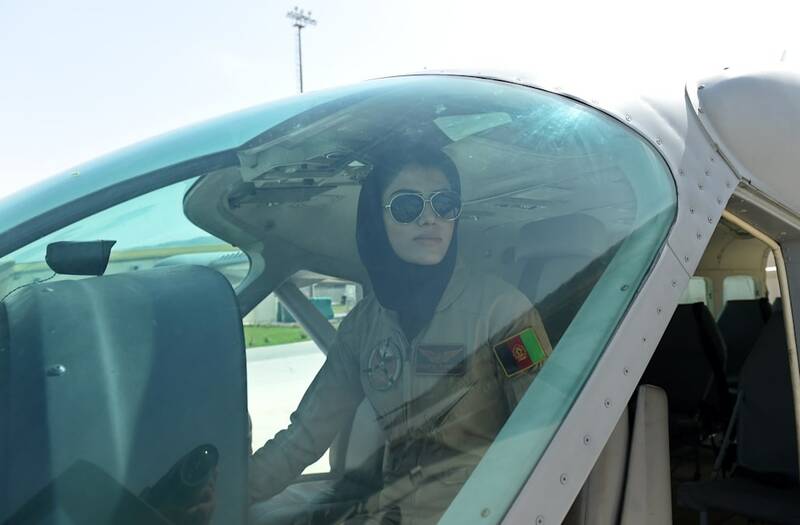 With a hint of swagger in her gait, Afghanistan's first female pilot since the ouster of the Taliban is defying death threats and archaic gender stereotypes to infiltrate an almost entirely male preserve. In a picture taken on April 26, 2015, Afghanistan's first female pilot Niloofar Rahmani, 23, sits inside a fixed-wing Afghan Air Force aviator aircraft in Kabul. With a hint of swagger in her gait, Afghanistan's first female pilot since the ouster of the Taliban is defying death threats and archaic gender stereotypes to infiltrate an almost entirely male preserve. In a picture taken on April 26, 2015, Afghanistan's first female pilot Niloofar Rahmani, 23, exits a fixed-wing Afghan Air Force aviator aircraft in Kabul. With a hint of swagger in her gait, Afghanistan's first female pilot since the ouster of the Taliban is defying death threats and archaic gender stereotypes to infiltrate an almost entirely male preserve. In a picture taken on April 26, 2015, Afghanistan's first female pilot Niloofar Rahmani, 23, poses for a photograph alongside a fixed-wing Afghan Air Force aviator aircraft in Kabul. With a hint of swagger in her gait, Afghanistan's first female pilot since the ouster of the Taliban is defying death threats and archaic gender stereotypes to infiltrate an almost entirely male preserve. Rahmani recently appeared with her attorney, Kimberly Motley, on CNN; when host Jake Tapper asked how they plan to make the case for asylum, Motley responded by citing threats and stating, "...If she [Rahmani] were to return to Afghanistan, she would be in fear of her safety." When Tapper mentioned an Afghan general's accusation that Rahmani was lying to get asylum, Motley said, "I think that quote demonstrates the...lack of support that unfortunately Capt. Rahmani has received in Afghanistan...That's exactly, frankly, the response that she received from other governmental officials when she would report such threats to them." Rahmani has been heralded as a symbol of what women can achieve, even in a conservative country. However, she has since indicated that conditions in Afghanistan are not improving, telling the Wall Street Journal, "I would love to fly for my country — that is what I always wanted to do. But I'm scared for my life."